Jonathan Marcelino, 17, from Watts wants to work in the technology sector after college. (Photo by Jordyn Holman). It is an issue that has garnered a statewide conversation. In his State of the Union address on Tuesday, President Barack Obama said “helping students learn to write computer code” is one of his goals for the coming year. The focus on the emerging sciences is also a goal shared by 46 states and the District of Columbia are trying to achieve with the roll-out of Common Core requirements, an education policy that includes the goal of bringing K-12 students up to speed in the science, technology, engineering and mathematics (STEM) subjects. Los Angeles Unified School District, the second-largest school district in the nation, has faced criticism over the past couple of years while working to implement technology within these new academic standards. Many of Marcelino’s friends either do not make the same decision as he regarding technology, or are not given the option. Marcelino said several of his friends’ families don’t own computers. In 2013, LAUSD faced an iPad fiasco that led to an overhaul of the $1.3 billion Common Core Technology Project. Superintendent John Deasy, who spearheaded the project, stepped down shortly afterward. Leaders in the district are now reevaluating how to best use technology in the classroom. While the district restructures, STEM programs are looking to fill the technology education vacuum by reaching low-income, minority communities — the demographic that makes up more than half of LAUSD— through afterschool and weekend programs. The Los Angeles public school system faces the same pressures that many urban-centered school systems encounter. LAUSD educates 650,000 students spread throughout 915 elementary, middle and high schools, according to Julie Charles, a coordinator of LAUSD’s technology initiative. The district also has a high population of low-income students, which means that many of its students, like Marcelino, might not have regular contact with reliable technology at home. Administrators looked to corporate sponsors in order to increase opportunities for students to use computers to complete school assignments. In June 2013, the Board of Education approved LAUSD partnerships with both Apple Inc. and Pearson programs. The goal at the time was to provide students with iPads loaded with Pearson educational software to use. Every student was slated to receive a working iPad by December 2014. In afterschool programs like TXT and Limitless STEM Academy teach middle and high school students how to code. (Photo by Jordyn Holman). During the LAUSD rollout, however, not every student was provided an iPad, and there were glitches in the software that had been installed to the devices. Some iPads didn’t have all the Pearson software and not every school received its shipment of iPads. A portion of the tablets were found to be missing because of holes in the device’s tracking system. The difficulties were nationally recognized when the FBI began probing the multimillion-dollar program in December 2014. The FBI looked into potential bid rigging after claims surfaced that Superintendent Deasy, Pearson and Apple had a prior relationship before the contracts were awarded to the two companies. The district’s interim superintendent halted the program in early 2015. Marcelino said he and his peers felt that based on their own research, iPads might not be the right technology for the classroom. In the wake of the mix-up, LAUSD created the Instructional Technology Initiative, or ITI, which allows individual classrooms to determine what technology is necessary to aid each specific learning experience. Options include iPads, Google Chromebooks and Microsoft Service Pro, Charles said. Yet, students agree that improvements could still be stepped up. Marcelino, who attended public school until his junior year of high school, said he eventually transferred to a private school because its classes were more technology-focused. For his first two years of high school he attended South L.A.’s Alain Leroy Locke Senior High School, which came under the supervision of Green Dot schools in the fall of 2008. Instead, Marcelino said, he would have liked classes that taught him how a computer worked and what needed to be done to make it function. He said he believed it was important to know that extra step. Part of bridging the digital divide, students and educators said, is finding a way to effectively place technology into students’ hands. Before his parents bought him a computer, Marcelino remembers handwriting his essays. His classmates had to type their essays on their phones. Some still do. 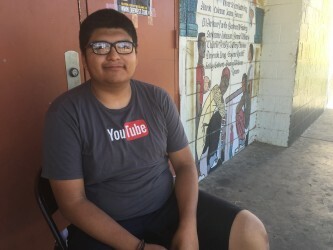 Marcelino now attends Verbum Dei High School in Watts, where he says he uses iPads and other computer technology in the classroom at least once a week. In his free time, he still tinkers around with breaking down and rebuilding computers. 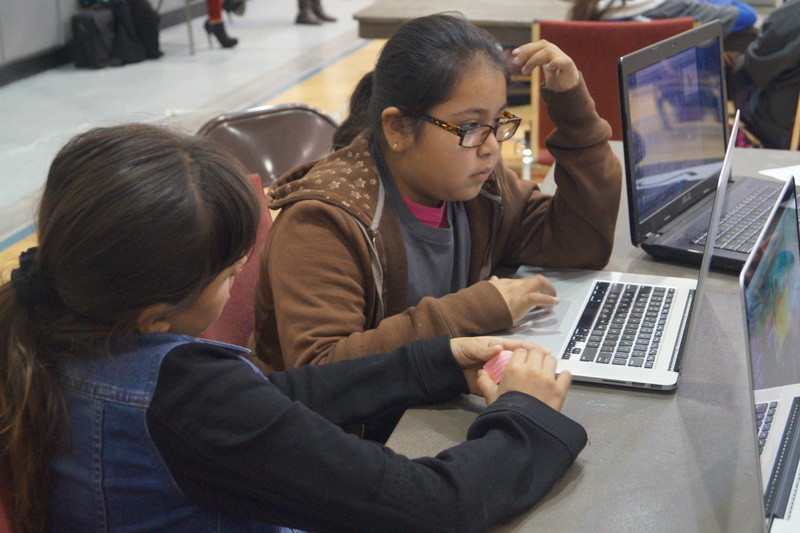 Educators who run after-school programs focused on technology have said the LAUSD curriculum doesn’t emphasize understanding the mechanics that go into building the technology or how it works once the students have devices in their hands. Chris Baccus, co-founder of Limitless STEM Academy, a coding camp that runs Saturday sessions in the basement of Southside Church in Inglewood, said a majority of his participants attend public schools within LAUSD. In his program, the 21 middle school students learn in non-traditional ways and work toward semester-long goals of writing code to make robots function. Within the Common Core, there are not specifications for students to learn code. Yet, Baccus says the Common Core’s emphasis on critical thinking and math skills aligns perfectly with what he’s teaching his students to do. Writing a line of code is a tedious process similar to learning a new language. All of the words and symbols must work together in order for the computer to understand which output the code is looking for. One of the sponsors of Limitless STEM Academy is the KISS Institute for Practical Robotics. KIPR has been around since 1994, making the long-term educational benefits of robotics accessible. The program has been trying to establish a partnership with LAUSD, Baccus said. KIPR board member and Limitless co-founder Minda Wilson said piquing student interest early on is key. Other extracurricular programs are also capturing students’ interest in the technology fields. Marcelino said he first found his passion in coding through TXT, which holds semester-long and 15-week summer programs operated in classrooms on the University of Southern California campus. 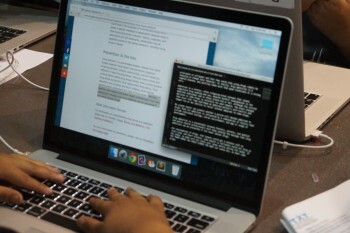 Students gain proficiency in several coding languages, including HTML and CSS. In high school, Menjivar, now 37, was like Marcelino in that he wanted more technology programs offered to him. Menjivar said once students from minority communities are exposed to this technology it is possible for them to begin realizing career possibilities in STEM. Nearly 80 percent of LAUSD students live in poverty and about 30 percent are learning English as a second language, according to LAUSD statistics. One of the latest initiatives Menjivar has worked on is bringing hackathon competitions, or all-day coding programs, to public housing complexes. The first one was held in August in Nickerson Gardens where Marcelino lives. The second hackathon was on Dec. 12 and brought more than 100 elementary and middle school students to the gym of Pueblo Del Rio Housing Development in South L.A.
Students learned how to code, with the promise of a free Dell computer to be awarded as the top prize. Students, mostly African American and Latino, came out in droves to participate in programs as their parents walked around the gym to watch what their young ones created on Google-powered technology..
Coordinators of both TXT and Limitless STEM Academy have said LAUSD teachers have reached out to them to try to engender this same commitment to STEM in all students in their classrooms. With the recalibration of the technology initiatives from the district’s high-level officials, Baccus and Menjivar said they hope this becomes a district-wide reality soon. The first step, Baccus noted, begins in educating students in elementary and middle school. Coding, like a language, is processed at a faster rate in younger brains. Some LAUSD teachers have already reached out to Limitless STEM Academy and TXT inquiring how accelerated programs could be integrated into public school curriculums to teach a large number of students how to effectively code. As the district hits restart on its technology plan, it is better addressing the way students learn with the technology it is instituting. After ITI tackles the technical issues and make sure every student receives their device, Charles said, a second phase will roll out. In Sept. 2015, the district released a follow-up report on its instructional technology initiatives spearheaded by the American Institutes for Research. The report showed that LAUSD made sure all schools involved in its technology program had Wi-Fi capability. It has also increased its technical and instructional supports. There are still strides to be made, the report acknowledged. “Although the desire is for positive change to be immediate, the reality is that educational settings are complex and implementation processes take time,” the authors wrote. One remaining hurdle is educating teachers and getting them to the level of effectively teaching students how to harness emerging technology. Many coordinators say they understand the district’s limitations and believe they’re able to help. “We’ve got a couple schools where we already taught the teachers at the LAUSD level and they’re struggling to implement it just because the resources at the school level,” said Baccus, who worked in the city’s public school district for 17 years. As the district continues to work out the kinks in its technology plan, Marcelino, who is wrapping up his college applications, said he hopes younger students like his 11-year-old sister will benefit from the initiative in ways that interest them in STEM.